It's not hard to dismiss Beach Buggy Racing on the face of it. It's even easier to do so once you find out it was originally a mobile game. 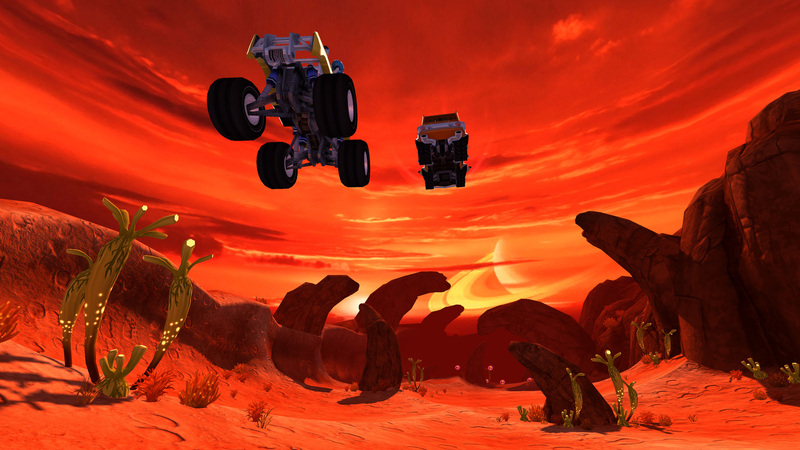 But is there more to this Mario Kart clone that meets the eye? Or should it have stayed on mobile devices? First thing you will notice is the controls. There is no in between. So if you use the thumbstick nothing will happen unless you are either all the way to the left or all the way to the right. This makes using the thumbstick incredibly annoying due to the time it takes u to get over to one extreme or the other. However using the D-Pad eliminates this issue due to the more instant nature of the buttons. Obviously being a Mario Kart type game driving isn't everything. Weapons play a huge part in the game and come randomly to you through the question mark bubbles. There is 27 weapons available which make it so it doesn't get stale too quickly. However it seemed like the AI opponents would always get exactly what they needed to ruin your day. Due to the rubber banding in the game this would mean that you would, more often than not, go from first place to 6th place. But when you don't get unlucky with the weapons it is actually a pretty fun game. There is 9 cups for you to compete in all with more than a handful of events to play. Not all of them races either. Some have you driving fast while shooting targets or ramming cars off the road. It's all very well spaced to give you variety as you play. 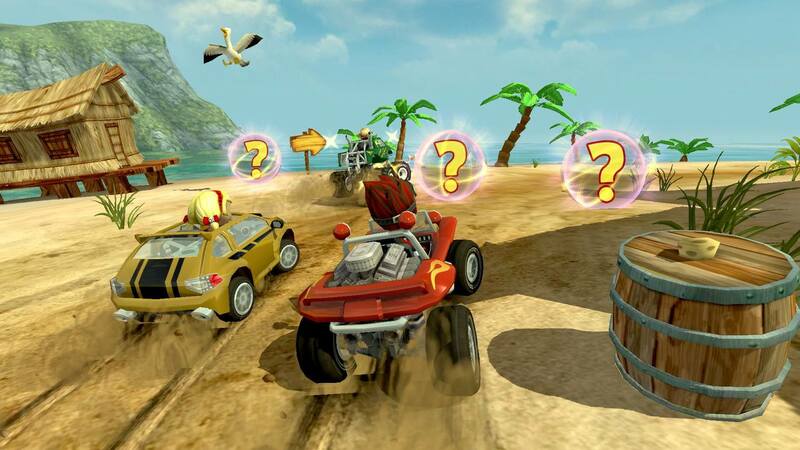 While playing these cups you will earn coins to level up your car through the 4 classes. 100HP, 250HP, 500HP and 1000HP. It's much like the classes in the Mario Kart series except you get to upgrade your vehicle (of which there is 8 to choose form) to meet the class criteria. Earning coins is simply a case of playing in races. You can earn bonus coins by doing daily challenges (even more so if you do them consecutively). Once you finish all 9 cups, which is no small feat (especially if you go for 3 stars on all events), you can still delve into the many championship series. each car has a championship for each of the classes. That's 32 championships to win! So you cannot fault this game for lack of content. It's bursting at the seams and for the asking price is a steal. There is also a quick race option where you can pick from the 15 tracks and 4 classes. 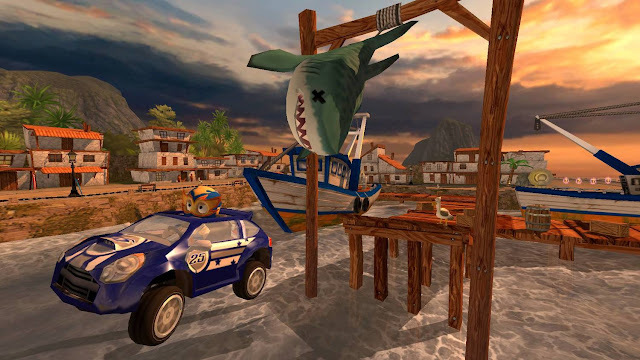 Graphically the game is very colorful too and there is a lot of variety to the style as well. 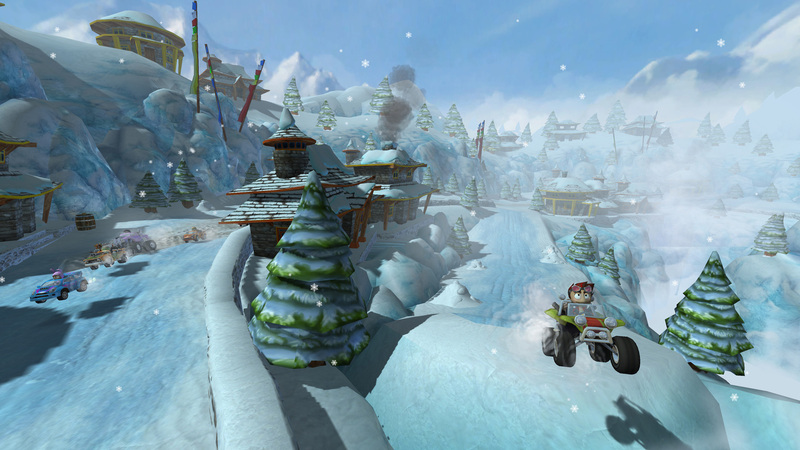 For example, one track is in a volcano while another is in an snowy Artic-esque environment. The music as well is very up beat in races and relaxed in the menus, its very well put together to be honest and gives the feel of party game much like Mario Kart does. 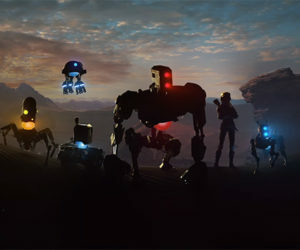 The biggest downfall of the game is the lack of online multiplayer. It does over 4 player splitscreen for you to mess around with your real life friends but if you want to play with your not so local friends then you are out of luck. This is a real shame because the game would be a lot of fun online. The trophies in the game are fairly straight forward, tasking you with getting all the stars in the cups and playing a huge amount of championships. The real grind however will come with the collection of 1 million coins and driving just shy of 10 kilometers. 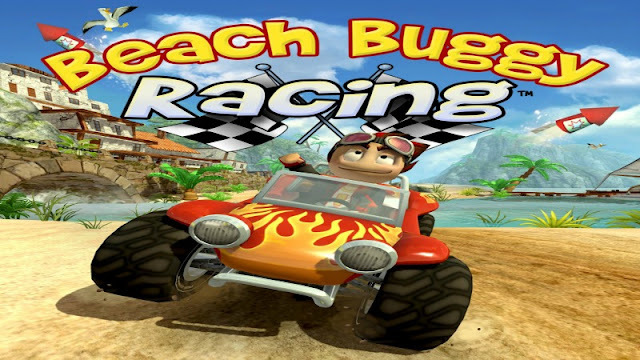 Overall Beach Buggy Racing is a surprisingly good party racer. While it has nothing on Mario Kart, it is definitely recommended for people without access to the latest Nintendo hardware who are fans of the Mario Kart series. What I Played: About 10 hours racing through various cups and championships and several daily challenges.